Lecture presented during a lunch-time seminar at the Carnegie Museum of Natural History, 22 October 2003. Abstract. The freshwater mussel fauna of South America is very poorly known. Although studied since 1792, few areas have been adequately sampled and much of the continent remains unstudied. A.E. Ortmann published a monograph on South American naiads in 1921 but made no references to the fauna of the Rio Orinoco, one of the largest drainages on the continent. H.B. Baker was the first to monograph the land and freshwater Mollusca of Venezuela, which he published in six parts from 1923 to 1930. However, much of Venezuela remains unexplored. Venezuela is located in the northeastern portion of South America between 1 and 12 degrees North latitude and 60 and 73 West longitude. There are four principal drainages: The Maracaibo Basin in the northwest, the direct tributaries along the northern coast, the large Orinoco River system and the Essequibo drainage in the east. The country is bisected by the Andes and in the interior is a large rolling periodically flooded grassland called the Llanos. Specimens were examined in most North American museums and fewer than 15 collection sites from the Rio Orinoco drainage were represented. Fieldwork conducted throughout Venezuela over the past nine years has added over 65 new sites and thousands of additional specimens, which has helped to clarify some distributional and taxonomic problems. 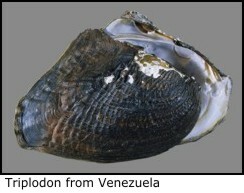 Examination of the literature and museum specimens, combined with field studies, brings the total number of described mussel species recorded from Venezuela to 19. The family Hyriidae is represented by six species in the genera Castalia (2), Diplodon (2), Paxyodon (1), and Triplodon (1). The family Mycetopodidae is represented by thirteen species in the genera Anodontites (9), Lamproscapha (1), Mycetopoda (2), and Tamsiella (1). Preliminary study of recent collections suggests the possibility of four new species. The four undescribed taxa include one species each in Castalia and Diplodon and two in Anodontites. Because of the size and remoteness of the country and the wide variety of habitats present, additional collecting will undoubtedly add new species to and expand our knowledge of the freshwater bivalve fauna of Venezuela. Lecture presented at an open Bivalvia meeting honoring Prof. Brian Morton, 15-16 September 2003, Cambridge, UK. This presentation was also given the 2004 Mid-Atlantic Malacologists (MAM) Meeting at the Delaware Museum of Natural History, 13 March 2004. Abstract. The Etherioidea, together with the Unionoidea, comprise the Unionoida, a cosmopolitan order of bivalves known colloquially as freshwater mussels or naiades. Traditionally, three families have been assigned to the Etherioidea (AKA Muteloidea) based on their unique lasidium-type larvae: Etheriidae, Mycetopodidae and Iridinidae. 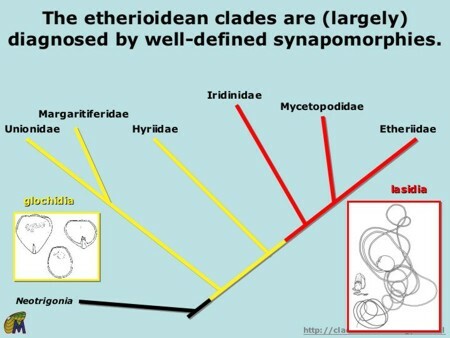 We also include the Hyriidae among the etherioideans based upon adult morphological characters. The superfamily is limited to the Gondwanan continents, and recent phylogenetic analyses suggest that we have not given these interesting mollusks the attention that they deserve. 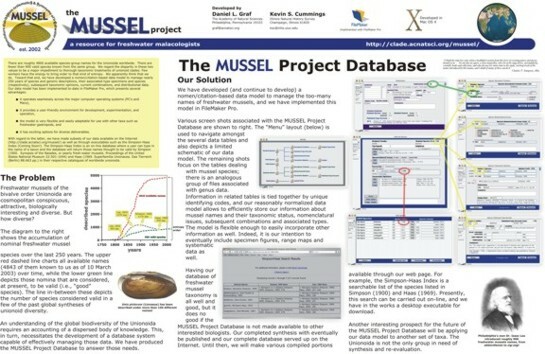 We will discuss our recently initiated endeavor to revise the systematics of the Etherioidea, the MUSSEL Project (http://clade.acnatsci.org/mussel). Slide showing the distribution of larval morphologies among the families of the Unionoida. Glochidia, shown in yellow, are a synapomorphy for the whole order. Lasidia, in red, are (apparently) modified glochidia and unite the Iridinidae, Mycetopodidae and Etheriidae into a monophyletic Etherioidea. Lecture presented at the 2003 Meeting of the American Malacological Society, 26-29 June, Ann Arbor, Michigan. Abstract. Freshwater mussels are not only interesting evolutionarily, given their Mesozoic origin, cosmopolitan distribution, complex parasitic life histories and exceptional process of cytoplasmic inheritance they are also globally imperiled and the focus of much conservation interest. To understand and minimally explain this diversity, it is necessary to at least be able to describe it. While modern treatments of the higher taxonomy of the Unionoida have tended to rely upon hypothesis-testing (i.e., cladistics), the current consensus of species- and genus-level global mussel diversity is dependent upon the authoritarian revisions of previous generations. A few workers of the 20th century C.T. Simpson, F. Haas, J. Thiele, H. Modell and Ya.I. 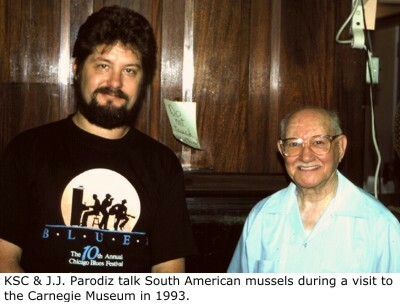 Starobogatov provided global syntheses of freshwater mussel diversity, but only Simpson and Haas dealt at the species level; Thiele, Modell and Starobogatov restricted themselves to genera. The tendency for mussel systematists to treat geographical regions rather than clades has led to several local revisions of parts of these already-conflicting global treatments. The resulting consensus is a jury-rigged system of often incongruent taxonomies. 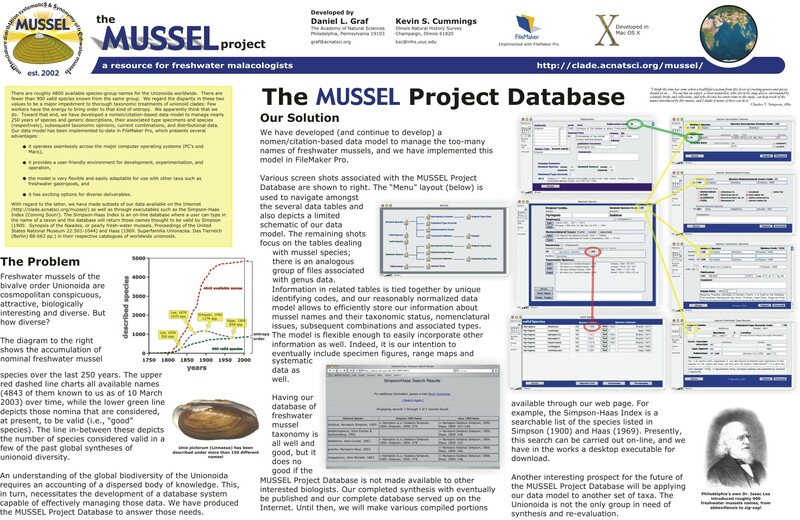 The MUSSEL Project (http://clade.acnatsci.org/mussel) is a collaboration, inaugurated in 2002, dedicated to pulling together this disjunct and dispersed data on unionoid taxonomy. The thrust of our efforts to-date have focused on assembling a database of the more than 4800 available names, < 20% of which are valid. We will present the results of our work to-date, including a brief description of the database we have developed for this purpose. 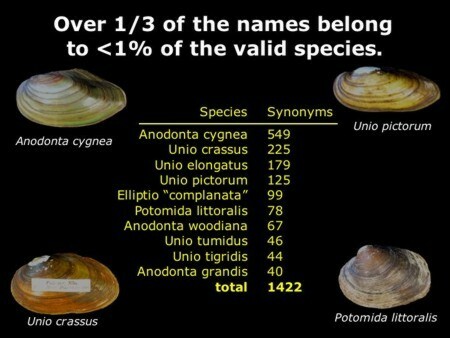 This slide illustrates the extent to which certain widespread freshwater mussel species have been over-named. Poster presented at the 2003 Meeting of the Freshwater Mollusk Conservation Society, 16-19 March, Durham, North Carolina. it has exciting options for diverse deliverables. With regard to the latter, we have made subsets of our data available on the Internet (http://clade.acnatsci.org/mussel/) as well as through executables such as the Simpson-Haas Index (Coming Soon!). The Simpson-Haas Index is an on-line database where a user can type in the name of a taxon and the database will return those names thought to be valid by Simpson (1900. Synopsis of the Naiades, or pearly fresh-water mussels. Proceedings of the United States National Museum 22:501-1044) and Haas (1969. Superfamilia Unionacea. Das Tierreich (Berlin) 88:663 pp.) in their respective catalogues of worldwide unionoids.